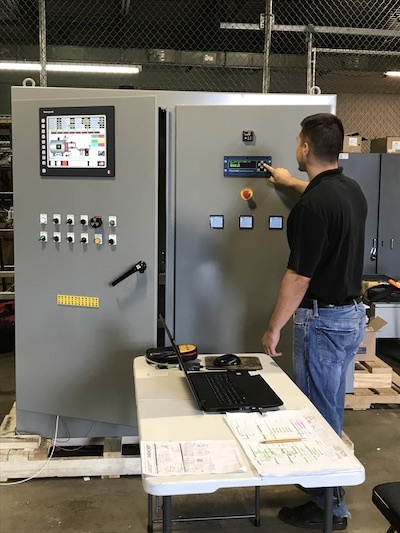 The Conrad Kacsik engineering team installs supervisory control and data acquisition (SCADA) systems tailored to the exact needs of any manufacturer. These modern systems allow for exacting control and monitoring of industrial processes either on-site or remotely. SCADA systems are effective for multiple industries, including thermal processing, manufacturing, pharmaceutical, food and dairy, water and wastewater, among others. We deliver the best solutions because our process starts with an engineering evaluation of your current system. We then offer recommendations that will enable you to achieve your goals and optimize performance. With an in-house engineering team using the latest hardware and SCADA software, Conrad Kacsik can build an ideal SCADA system for any application. Conrad Kacsik uses the industry-leading SCADA software SpecView, which is capable of supervising all your processes and becoming the main SCADA control and data collection center for your system. SpecView places the information you need right at your fingertips—whether it’s internally accessed from your own network or remotely accessed via a secure web connection. We have deep experience programming this SCADA software, which means we can develop a highly customized, user-friendly interface that allows you to easily control processes and capture key SCADA data. We can also build a platform that will integrate with existing hardware—solving all your process control, data collection and reporting challenges. SpecView is highly versatile. In addition to thermal processing, it can be used for a wide variety of other applications, including those most commonly found in the semiconductor industry, crystal growing, food processing and environmental chambers. Additionally, it can be used in the continuous process plants of companies that deal with chemicals, glass, refining, extrusion processes and landfill or water treatment. And if you need a custom-designed HMI software solution and you work in beverage distribution, facility monitoring or within the plastics and refrigeration markets, Conrad Kacsik can help. Conrad Kacsik can implement SCADA systems in phases to meet budget and planning needs. Each SCADA component can be installed independently, so data acquisition can come before supervisory control. Better yet, these tools often work with existing instrumentation, minimizing new equipment costs. We use open architecture and non-proprietary systems, which means you’re not bound to us or any single OEM should your future needs change. Our systems also provide for unlimited “tags,” which reduces software costs compared to other HMI software. Conrad Kacsik customizes each SCADA system for specific requirements. This can range from simple data acquisition to a fully integrated automation and control system—or anything in between. We offer touch-screen controls and user-defined screens based on customer specifications. Contact us to see how we can enhance your SCADA capabilities and help enhance your bottom line.